Chess is a great game, perhaps impossible to improve upon. Yet chess players will sometimes decide to mix things up, just for fun, by playing to different rules. They might introduce new pieces, or new powers for current pieces, or even change the point of the game. This is called “fairy chess”. Likewise, Rugby Union is a wonderful game, perhaps impossible to improve upon. But, just for fun, here’s a few rules that you might want to muck around with. So without further ado, I present to you the somewhat unfortunately named “Fairy Rugby Union”. All rules are the same as in Rugby Union, except where stated below. Scrums are great, but they also slow the game down. Replace with free kick for the team which would’ve had the put in. The offside rule, just like the forward pass rule, is unintelligble to many from largely non-Rugby-playing nations. Do away with offside altogether. Now that tries will be relatively easy to score, change the ratio of points. For example, goals are still worth three, but a try is now two and a conversion five. And there we are. Have fun! The year was 2000, and I was 15 years old. I was watching a football match. Some random team against Manchester United. 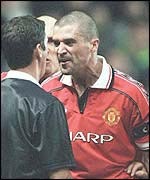 Roy Keane, Man United captain, decided to flip out for no reason, as usual, and get in the referee’s face. Aggressive and with split flying everywhere, screaming at the arbitrator, shoving him, and forehead marching the ref backwards. If he’d done that in the street, he would’ve been knocked on his arse. But this was football, and therefore par for the course. Witnessing this, something broke inside me. I just couldn’t bear to watch these overgrown children, these arrogant spoilt petulant idiots getting in the face of refs and being twattish anymore. That was the moment I fell out of love with football. Indeed, it turned me off all sport. It was only in 2006 that I started to get back into sport. This turning away from sport had rather unfortunate timing, though. I did not watch the 2003 Rugby World Cup. The only World Cup I have missed since watching my first one, South Africa 1995. The only World Cup England have won. I did not watch the 2003-04 football season. The one where Arsenal broke history by going through a whole season unbeaten: the so-called “invincibles”, the peak moment in Arsenal FC’s history. Yes, Roy Keane prompted my sporting crisis and made me miss the greatest moments for my club and country that will ever happen. I can never get those moments back. And that is why I hate Roy Keane. That is why Roy Keane is more evil than Hitler. I think I’ve seen the most offensive advert of all time (or, at least, of recent times). Gareth Thomas, rugby player, stony-faced gives the voiceover, his voice breaking with emotion as emotional music plays. Everything I went through out there [on the rugby pitch] was nothing compared to the demons inside. In my darkest hour, I turned to my teammates. Telling them I was gay, was the toughest thing I’ve ever done. But when I needed them, they were there for me. Gareth Thomas emerges from the tunnel onto the rugby pitch, head held high and chest out, walking proudly to face the masses. Always part of a team. Now fade in… a pint of Guinness(!?) and the words Guinness: made of more. Sorry, but what the f***!? Gareth Thomas overcame sporting prejudice to say, “I am gay”. Even footballers, who play a much less manly sport, won’t come out. And when they do, it doesn’t end well: just look at Justin Fashanyu. I’m sorry, but even by advertising’s slack standards, that is a disgusting advert. The struggle and turmoil of one man, the fight for LGBTI rights worldwide in the face of continuing violent opposition. All reduced to flogging Guiness. What a load of offensive and cynical sh*t. It’s like nothing in this world has any worth anymore. Disgraceful.